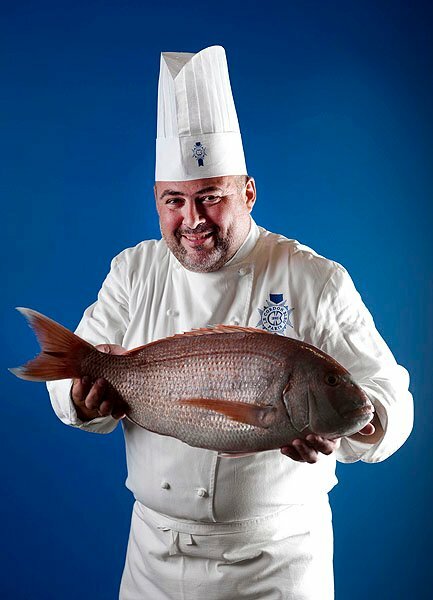 Originally from the Ile-de-France, Chef Olivier Guyon holds a “Certificat d’Aptitude Professionnel (CAP)”. Following graduation, he began his career in reputed Parisian restaurants including the one Michelin-starred Le relais d’Auteuil, and the Vernet hotel’s two Michelin-starred restaurant Les Elysées. With solid professional experience behind him, Chef Olivier Guyon decided to take on the challenge of working internationally and moved to New-York, where he spent 2 years working at Daniel’s restaurant. Chef Guyon then returned to France to expand his culinary horizons and gain further experience in prestigious restaurants. His initial posting was as 1st “sous-chef” at the Warwick hotel’s one Michelin-starred restaurant, Le W, before continuing in the same role at the Royal Monceau’s Le Jardin, which also has one Michelin star. In 2003, Chef Guyon took over the running of the kitchens of Goumard, which was awarded its first Michelin star in 2004. In 2009, Chef Guyon became Cuisine Chef at Maxim’s in Paris, where he remained for 3 years and created recipes and photographs for the book Maxim’s mémoires de la vie Parisienne. During his career, Chef Guyon has contributed to the writing of two cookbooks: Les légumes de Joël (Editions Flammarion), and Le meilleur de la truffe. Chef Guyon joined Le Cordon Bleu Paris team of Chef Instructors in June 2015.